Over the last few years, digital marketing has taken the Internet by storm. And, one of the most important aspects of online marketing is visual content, which impacts sales and consumer decisions, the most. The creation of apt and powerful visual content is among the top priority for marketers in the coming years. Visual content can be of various types – images, audio, video, and many more. Not all visual content suits all brands or businesses. It is very important to research on the type of visual content that will make your brand successful and move ahead with a proper visual content strategy to maximize ROI. Creation of the right visual content is a tedious task and might go through several iterations. We have seen many examples of visual content campaigns failing due to lack of market insight and proper analysis. Visual marketing is cost sensitive, hence budget also plays an important role. With more and more businesses moving online, marketers need to adapt to new visual marketing trends to keep up with the competition. Since, visual content is a creative sector and appeals more the emotional quotient of consumers, it has to be crisp, clear, precise and up-to-date to be effective. Here are some of the visual marketing statistics, which worked in the last year and marketers need to be aware of, for successful campaigns in the future. Coloured images increase the willingness of a viewer to read by 80%. People can recollect 65% of the information after 3 days, if it has an image. Content with relevant images get 94% more views than those with irrelevant images. Online shoppers who watch videos are likely to purchase 1.81X more than non-viewers. Mobile Marketing has increased by 44%. In the second quarter of 2015, mobile phones and tablets combined for 49% of video ad impressions. 9% of marketers feel that video content fetches the best ROI. Infographics are liked and shared 3X times more than normal content. People follow instructions with text and illustrations 323% better than without these. Visual content is 40X more likely to be shared than regular text. Facebook posts with images are 2.3X more engagement than those without images. According to Digiday and Chute, around 20.3% of marketers feel that visual content is 3X more effective than text content. According to Moz, posts with videos are likely to attract 3X more links than text-only posts and statistics from Invodo tell that people are 85% more likely to purchase a product after they view a product video. How are marketers using the information? 34% of marketers consider visual content as their most important asset. 65% of senior marketing executives feel that visual content is most important in communicating their brand. 39% of marketers feel that more budget should be going towards the creation of visual assets. 73% of B2C content creators will prioritize creating more engaging content by 2016, while 55% of them will prioritize creating visual content. 60% of marketers feel that there will be an increase in the use of Infographic in 2016. Visual content budget increased by 3 to 5% in 2015 and it will likely to increase by the same figure in 2016. 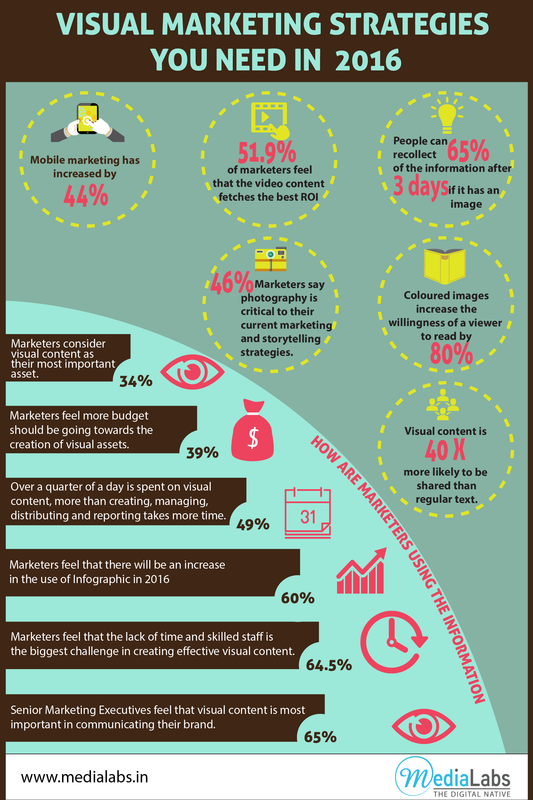 5% feel that lack of time and skilled staff is the biggest challenge in creating effective visual content. 49% feel that over a quarter of a day is spent on visual content; more than creating, managing, distributing and reporting takes more time. There are more of these insightful statistics in the links provided. As we see that, visual marketing is the growing trend and will keep influencing business growth and sustainability. So, keep a track on these market trends and keep evolving to be able to deliver the best on the web. The concept of ‘seeing is believing’ can be challenged in modern times, but in digital marketing, brands proactively use the sense of vision and hearing to stimulate other human senses, that can trigger an association. Digital Marketing, mainly prefers to online campaigns, including promotion and sales over social media and other digital platforms like websites, e-commerce portals and others. How impactful is video marketing? Recent research shows that video users grow revenue 49% faster than non-video users. It also showed that nearly 1 in 4 B2B marketers did not know the ROI of the video content that they are using. This is because that they are only tracking the basic parameters like number of views or shares. However, businesses, which go a step further to track advanced data have experienced a 2X improvement in video ROI. This is done by integrating their video data into the CRM system and sales pipelines to yield effective results. Though, the importance of video marketing is perceived by 76% of marketers, but only 15% have integrated into their system and using it properly. However, the number of marketers, who is using video data has increased to about 67% in the last year alone. Experts feel the video marketing is the in-thing and it can be used to optimum advantage. A video advert on the landing page of any website results in 80% conversions and 64% consumers are likely to buy a product, after watching the video ad. How video impacts digital marketing? Seeing is selling: As pointed out earlier, consumers are likely to buy if they see a live demo. So, video ads show consumers a lot more than normal print ads. Video is a way to engage the audience in a better way with lights, music, colors and the message. It tries to target human emotions in a better way. Audience Engagement: Audience reach is much more and it helps to build brand visibility and viewership. Videos, just do not tell us ‘what’ the product/service is, but also tells us ‘how’ and ‘why’. They show us a story, which we can relate to. Research shows that with video content, the chances of making into the first page listing of Google increases by 53 times. Integration: Video content, when integrated with other web content is one of the most powerful marketing methods, with a higher reach. A blog post multiplies its viewership, if there is an accompanying video. A research by Marketingland says, that video has 50 more chances of getting an organic page rank in Google then just plain text. Targeting and Measurement: With TV commercials, it is difficult to target the right audience and measure the ROI. However, in digital marketing, video can be used to target a particular niche as well as reach the bigger populations. It is also easier to measure the ROI. YouTube is the second largest search engine, which has been an effective platform to promote video content, says a study by Social Media Today. Video in digital media can also be customized to give the audience the necessary information, as well as entertainment. It is a much cheaper option than TV commercials. Smartphone users are among the highest, who access video content and are likely to turn into future prospects. YouTube recorded 4 billion hours of video usage per month. With large volumes, video marketing will surely reap the desired benefits after initial investments. How experts have predicted the future of video marketing? Video marketing has picked up well across different platforms like mobile, social media, and even hoardings. The format of video ads have also differ over different media. According to a new study, mobile viewers prefer a vertical video experience. For example, a full screen vertical video ad on Snapchat will fetch a 9x higher completion rate than a horizontal video ad. Social media platforms like Facebook, who are likely to get 75% of their ad revenue from mobile by 2016 are also integrating their own video player. Facebook has already got 1 million video views each day. With the growing popularity of video marketing, experts feel that 74% of internet traffic will be video content by 2017. Video marketing is here to stay and marketers need to make the most and best out of it. Over the next 3 to 5 years, about 3 out of 4 brand marketers and ad agency executives will give importance to original digital programming like TV programming. If you have a product or service to sell, and yet to use video marketing to your advantage, then you are probably missing out on a lot of sales opportunities and consumer engagement. So, it is time you implement and integrate video marketing to promote your business to cater to the new-age buyers over digital marketing. Everyone talks, but not everyone can talk effectively. Effective speech is a gift that most do not have, but it can be cultivated. There are some simple rules that need to be remembered for a presentation to be effective. Some of the basic rules are to be well prepared and relaxed, confident that your performance will have the desired impact on your audience. Each slide of a presentation should hold a short message and a corresponding picture that enhances the thought behind the slide. Less words and more picture technique is highly effective. A picture is worth a thousand words. This rule is applicable to almost everything creative. A very complicated message leaves the audience confused. A presentation that runs over 25 minutes leaves the audience drained. A story has the ability to hold the attention of an audience much better than that of a long drawn explanation. It engages the audience, makes them retain the information. When it is a rehearsed story, there is more confidence and air of knowledge, which is well appreciated by an audience. Research says that we can remember only three things at a time. It is therefore best to mark three key areas that you want the audience to remember and take away from the presentation. It is also important to keep a maximum of three points in a slide. Leave out the bullet points as it makes the slide look like the presenter’s notes. It is important that you do not keep turning back to the presentation to see the upcoming slide. It leaves the audience thinking that you are seeing the presentation for the first time. The third law of Murphy – “when something can go wrong, it will” is very applicable in presentations as well. It is always prudent to be prepared with a back-up of the presentation and some printed copies to be circulated in case of a power cut or a projector malfunction. There will always be new learning from every presentation. Each one will always be better than the previous one. It is up to you to choose to keep in mind these simple rules to make a perfect presentation. If you need any help with content creation, corporate presentations, infographics and explainer videos, please subscribe to this blog to ensure that you never miss an article. Do you need to create corporate presentations, infographics and explainer videos? Mail us at info@medialabs.in. Need to know more about our work? It’s easy! Simply visit our page at www.medialabs.in and check it out yourself. Follow us on Twitter, LinkedIn, Google+ and Facebook to get more updates.